Hurricane Cristobal is still gaining strength in the western Atlantic Ocean, but, fortunately, is splitting the uprights between North Carolina's Outer Banks and Bermuda. Hurricane Cristobal is moving toward the northeast and accelerating, steered by a southward dip in the jet stream in the western Atlantic Ocean, high pressure aloft in the central Atlantic Ocean, then by the upper-level westerlies once it gains more latitude. Cristobal is of no direct threat to the U.S. East Coast and will pass well to the north and west of Bermuda. However, that's not to say there aren't impacts along the East Coast. Persistent north to northeast winds around Cristobal's circulation will continue to produce high surf and rip currents along parts of the East Coast before Cristobal pulls farther into the Atlantic later this week. In particular, Florida's Atlantic beaches, the Outer Banks of North Carolina, southeast Virginia, the Delmarva Peninsula and Jersey shore will see a high risk of rip currents and high surf before winds turn offshore and subside early Thursday. Swells from Cristobal will also spread to the Atlantic beaches of Long Island and coastal southeast New England, persisting through Thursday. Cristobal will track sufficiently to the west and north of Bermuda to restrict impacts to simply locally heavy rain and high surf/rip currents. Nevertheless, Cristobal has a fairly decent-sized wind field, so tropical storm-force winds are possible in Bermuda through Wednesday night. According to the Bermuda Weather Service, rainfall from Cristobal may push the area to a record August rainfall total (13 inches) at L.F. Wade International Airport. Cristobal will eventually merge with a cold front off the Canadian Maritimes late this week, transition to a non-tropical cyclone east of Newfoundland and potentially track toward Iceland this weekend. After a few days moving through the Caribbean as an unorganized cluster of storms, Air Force Hurricane Hunters flew into the disturbance on August 23 to determine whether a surface low pressure circulation -- which requires not only the east or northeast winds typically found in the Northern Hemisphere tropics, but also a westerly wind -- was present. The Hurricane Hunters found that as of August 23, a closed center of circulation was detected and officially declared the system a tropical depression. On the morning of August 24, Hurricane Hunters detected sustained wind of 45 mph, which officially turned Tropical Depression Four into Tropical Storm Cristobal. On August 25, the Hurricane Hunter detected sustained wind speeds of 75 mph, which official turned Cristobal from a tropical storm to a hurricane. Mudslides and flash flooding were reported throughout the island of Puerto Rico as the tropical system pushed through the Caribbean. Flooding was also reported in parts of the U.S. Virgin Islands, as well as the Turks and Caicos. In the wake of the accidental death of a gun instructor in Arizona, many are likely asking how a 9-year old was allowed to hold and fire an automatic weapon. But gun laws in the United States — specifically those concerning minimum legal age requirements for gun possession — are actually still surprisingly lax. Federal law prohibits handgun ownership by any person under the age 18, with a handful of exceptions. But there is no minimum age for long gun (i.e. rifle and shotgun) ownership. Twenty states and the District of Columbia have set their own minimum age laws ranging from 14 in Montana to 21 in Illinois, but in the remaining 30 states it’s technically legal for a child to possess a long gun. That doesn't mean that a child can walk into a gun show and purchase a gun. "There are federal laws for minimum age purchasing of firearms," said Daniel Webster, the director of the Johns Hopkins Center for Gun Policy and Research. "Technically, anybody selling a gun in that context should look for age verification that someone is at least 18 years old." But a child's parent could. "If dad wants to give his son a rifle or a shotgun on his 13th or 14th birthday, he's pretty much free to do that in most states," Webster said. It's also perfectly legal in many states for children to fire guns of all types at shooting ranges, like the one where the accidental shooting took place yesterday, so long as an adult or instructor is present. The gun used at the shooting range incident, an Uzi, is a submachine gun that could be classified as either a handgun or a long gun depending on the model and any modifications to the gun. While federal law would prohibit minors from owning the pistol version of the gun, there are no such federal restrictions on the rifle version. "The laws aren't designed in essence to protect children from accidental shootings of this nature," Webster said. "There's a mindset that's fairly prevalent in the U.S. that there's nothing wrong with kids firing guns." The industry pitch for the gun has revolved around the efficiency of its operation and thrill of its use. "Shooting the UZI pistol is just pure, economical recreation with a ton of fun thrown in," Richard Turner, the vice president of sales and marketing for Umarex USA, which manufactures the gun, told the magazine Guns & Ammo in 2012. Tuesday's incident, however, highlights the gun's potential for danger, and the potential danger in gun use more generally. Accidental gun deaths make up a significant portion of overall gun deaths in the United States. The good news is that while gun injury statistics are notoriously spotty (by design), gun fatality data from the CDC shows that accidental gun deaths have been on a steady downward trajectory since at least 1999. There’s a similar, though less pronounced, trend for all accidental gun injuries. But it’s important to note that these numbers could be too low. A recent study found that federal reports of accidental child gun deaths are significantly underreported. There’s good reason to assume that accidental gun deaths and injuries are underreported for all ages. "You are potentially looking at accidental shootings that are twice current estimates," said Sam Bieler, an Urban Institute researcher who studies gun violence. Webster believes that there are both cognitive and physical limitations in children that make it more difficult for children to understand and apply rules they are taught from a young age. "A very common view of gun-owning parents is that what gun safety is all about is teaching your children rules," he said. "What they don't consider are the developmental issues and physical abilities of children to actually follow these instructions. It was obvious to me when I saw this nine-year-old girl holding an incredibly powerful gun like an Uzi. Why anyone was surprised when she couldn't handle the recoil is beyond me." The National Rifle Association didn't immediately respond to a request for comment. Seven years ago, the U.S. Department of Veterans Affairs rejected allegations by media outlets and watchdog organizations that America faced a suicide epidemic among former military personnel. The VA claimed just 790 veterans under department care had taken their own lives that year. Yet, by reviewing available public records since 2005, CBS News uncovered 6,256 suicides. As VA officials publicly disputed the network's data, Dr. Ira Katz, the top mental-health officer, was sending internal e-mails titled "Not for the CBS Interview Request." "Shh!" Katz wrote in one message. "Our suicide prevention coordinators are identifying about 1,000 suicide attempts per month among veterans we see in our medical facilities." When the e-mails were disclosed, confirming the CBS findings, some members of Congress called for Katz's resignation or termination. Today, Katz remains at VA headquarters as acting director of mental health operations. In a phone interview with The Arizona Republic, he and Caitlin Thompson, deputy director for suicide prevention, said veterans' mental-health care is a national success story that merits a B+ if graded on a curve against other programs. Katz said recent data indicate the suicide rate is increasing among men in the general U.S. population but is stable among VA patients. "We're doing relatively well by fighting this trend," he added. An official Veterans Affairs statement to The Republic supplemented that point: "Getting help from VA does make a positive difference, and treatment does work. VA's basic strategy for suicide prevention requires ready access to high quality mental health ... services supplemented by programs designed to help individuals and families engage in care." The positive evaluations come despite VA findings that the number of veteran suicides began rising in 2007. They also come amid confusion over just how many veterans are taking their own lives. A fact sheet published by the VA's Suicide Prevention Program in 2012 reported 18 veteran suicides daily, while a "Suicide Data Report" issued by the same program in the same year put the number at 22. In 2013, the VA and Defense Department published a clinical-practice guide saying 18 to 22 die daily. Even the higher number is suspect. Craig Northacker of Vets-Help.org said death records do not capture the real tally of veterans' suicides, which he estimates at 30 to 35 daily. Thompson acknowledged the data dilemma: "Numbers of suicides are just very, very difficult to get, period." But other evidence hints at the magnitude of the crisis. As of June 2012, the national VA Suicide Prevention Line was getting roughly 17,000 calls per month — up more than 17 percent from 2009. Four out of five were veterans seeking help, nearly one-third of them contemplating suicide. The B+ grade from Katz also seems to clash with criticism from Congress, watchdog organizations and whistle-blowers who say VA mental-health programs are beleaguered by delays in care, dishonest record-keeping and staffing shortages. • In Georgia last year, the inspector general said 16 veterans who were sidetracked in the appointment system had attempted suicide while awaiting mental-health care. • In St. Louis, Chief of Psychiatry Dr. Jose Mathews discovered that doctors on his staff were seeing just six veterans a day — spending only 3½ hours in patient contact per shift. Mathews testified in a House hearing that veterans became so frustrated with VA mental-health care they quit after one or two visits. When Mathews tried to enact reforms, he was investigated, bullied and removed from his job. • At the VA hospital in Brockton, Mass., an Office of Special Counsel report said one patient went eight years without a psychiatric evaluation and another went seven years without a single note in his chart. In 2012, according to an inspector general's report, seven of 10 VA mental-health workers said they were short-staffed. The problem: low pay, undesirable work conditions and a national shortage of mental-health professionals. At the same time, veterans report abysmal satisfaction rates. When the American Legion surveyed members recently, 59 percent said they felt "no improvement" or were "feeling worse" after going to the VA for treatment of traumatic brain injuries and post-traumatic stress disorder. Thirty percent terminated treatment early. A survey by the Iraq and Afghanistan Veterans Association released last month says more than half the respondents have a mental-health injury and 31 percent have considered taking their own lives. Nearly half said the VA is doing a "bad job" with mental-health services, and two-thirds indicated scheduling "challenges." Such findings seemingly conflict with the VA's own survey last year, which said mental-health patients "strongly agree" they receive timely, effective and respectful care. A March poll by the Washington Post and Kaiser Family Foundation found that more than half of post-9/11 vets know a service member or veteran who committed suicide or attempted to do so. Suicides also have been prominent in the nearly $200 million worth of wrongful-death settlements paid by the VA during the past decade. One case documented by the Center for Investigative Reporting involved a Marine veteran who hanged himself with a garden hose after being turned away from a VA psychiatric-care clinic. Another was filed by a widow whose veteran husband shot himself after a disability claim for PTSD was turned down. From 2005 to 2013, meanwhile, the number of veterans receiving mental-health care increased 63 percent. More than half of those who served in Iraq and Afghanistan have sought treatment. Still, it may be difficult to blame a lack of funding for shortcomings. In 2001, the Veterans Health Administration, the VA's medical branch, spent just over $2 billion on mental-health programs. As of this year, that amount had more than tripled to $7 billion. VA officials did not provide staffing ratios for mental-health care. But a 2014 department report says nearly 9 percent of the budgeted positions are vacant, and most hospitals would have to add even more positions to properly serve veterans. Under heat from veterans' advocates and Congress, the VA has pressed to improve service. The department created a suicide red-flag system, financed research, opened a national crisis line and developed education programs. In 2012, President Barack Obama launched a campaign to fill the shortage of psychiatrists and social workers at VA hospitals nationwide. Since then, 2,752 mental-health workers have been added, raising the total from 18,383 to 21,135. Amid a nationwide shortage of psychiatrists, the VA has increased pay and is offering recruitment and retention incentives. During a July hearing of the House Committee on Veterans' Affairs, Rep. Mike Michaud, D-Maine, noted that the VA's spending on mental health has doubled since 2007. "But it's not working," he added. "We have to figure out why." Rep. Jeff Miller, R-Fla., the committee chairman, said overall suicide rates among vets may be stable, but deaths among those veterans ages 18 to 24 skyrocketed 70 percent during the past three years. During the July hearing, Miller interrogated Maureen McCarthy, deputy chief of patient-care services for the Veterans Health Administration, about her agency's mental-health data. "Would you bet your life on any number that somebody (from VA) gives you is a truthful number? Because we just had a panel of witnesses who've lost their children. They lost their lives," Miller said. "Now I'm asking you, would you bet your life that the information that people are telling you is truthful?" McCarthy responded, "Sir, I would not. I would not bet my life." Rep. Ann Kirkpatrick, D-Ariz., anguished while addressing families of suicide victims at the hearing. "Your testimony is heartbreaking," she told them, "and I can barely hold back my tears." As a result of the controversy and criticism, Katz said, VA administrators are reviewing psychiatric-appointment protocols, patient ratios, productivity and private-care options. Even a B+ department can improve, Katz said, and he urged disenchanted veterans to reconsider VA mental-health services. "We hope they would give us another chance, and we hope we would rise to the occasion," he said. Sentinel makes its money by getting the offenders on probation to pay for the company’s services. Charges can range from $35 to $100 a month. Sentinel is a part of the expanding universe of poverty capitalism. In this unique sector of the economy, costs of essential government services are shifted to the poor. In terms of food, housing and other essentials, the cost of being poor has always been exorbitant. Landlords, grocery stores and other commercial enterprises have all found ways to profit from those at the bottom of the ladder. The recent drive toward privatization of government functions has turned traditional public services into profit-making enterprises as well. In addition to probation, municipal court systems are also turning collections over to a national network of companies like Sentinel that profit from service charges imposed on the men and women who are under court order to pay fees and fines, including traffic tickets (with the fees being sums tacked on by the court to fund administrative services). When they cannot pay these assessed fees and fines – plus collection charges imposed by the private companies — offenders can be sent to jail. There are many documented cases in which courts have imprisoned those who failed to keep up with their combined fines, fees and service charges. “These companies are bill collectors, but they are given the authority to say to someone that if he doesn’t pay, he is going to jail,” John B. Long, a lawyer in Augusta, Ga. active in defending the poor, told Ethan Bronner of The Times. Collection companies and the services they offer appeal to politicians and public officials for a number of reasons: they cut government costs, reducing the need to raise taxes; they shift the burden onto offenders, who have little political influence, in part because many of them have lost the right to vote; and it pleases taxpayers who believe that the enforcement of punishment — however obtained — is a crucial dimension to the administration of justice. This new system of offender-funded law enforcement creates a vicious circle: The poorer the defendants are, the longer it will take them to pay off the fines, fees and charges; the more debt they accumulate, the longer they will remain on probation or in jail; and the more likely they are to be unemployable and to become recidivists. And that’s not all. The more commercialized fee collection and probation services get, the more the costs of these services are inflicted on the poor, and the more resentful of the police specifically and of law enforcement generally the poor become. At the same time, judicial systems are themselves in a vise. Judges, who in many locales must run for re-election, are under intense pressure from taxpayers to cut administrative costs while maintaining the efficacy of the judiciary. In dealing with more serious crimes involving substantial sentences, the rising costs of maintaining and building new prison facilities has prompted many state governments, and even the federal government, to turn to the private prison industry. This industry, which began to grow in the early 1980s, now faces significant problems. As incarceration rates drop, and as some states adopt more lenient sentencing practices, the industry is struggling to find new ways to fill vacant cells. These numbers reflect the brutal math underlying profit margins in private prisons. The “revenue per compensated man-day” for each inmate rose by 35 cents from $60.22 in 2012 to $60.57 in 2013. But expenses “per compensated man-day” rose by 70 cents from $42.04 to $42.74, for a net decline in operating income for each inmate from $18.18 a day to $17.83. In combination with declining occupancy rates, the result was a dip in total revenue from $1.72 billion in 2012 to $1.69 billion in 2013. The founders of C.C.A. include Tom Beasley, a former chairman of the Tennessee Republican Party. One of its early investors was Honey Alexander, who is married to Senator Lamar Alexander, Republican of Tennessee. Alexander, according to the Sunlight Foundation, has received in excess of $63,000 from C.C.A. employees and the company PAC since his election to the Senate in 2002. Poverty capitalism and government policy are now working on their own and in tandem to shift costs to those least equipped to pay and in particular to the least politically influential segment of the poor: criminal defendants and those delinquent in paying fines. Last year, Ferguson, Mo., the site of recent protests over the shooting of Michael Brown, used escalating municipal court fines to pay 20.2 percent of the city’s $12.75 million budget. Just two years earlier, municipal court fines had accounted for only 12.3 percent of the city’s revenues. What should be done to interrupt the dangerous feedback loop between low-level crime and extortionate punishment? First, local governments should bring private sector collection charges, court-imposed administrative fees and the dollar amount of traffic fines (which often double and triple when they go unpaid) into line with the economic resources of poor offenders. But larger reforms are needed and those will not come about unless the poor begin to exercise their latent political power. In many ways, everything is working against them. But the public outpouring spurred by the shooting of Michael Brown provides an indication of a possible path to the future. It was, after all, just 50 years ago — not too distant in historical terms — that collective action and social solidarity produced tangible results. American kids are getting ready to head back to school. But the schools they’re heading back to differ dramatically by family income. Which helps explain the growing achievement gap between lower and higher-income children. Thirty years ago, the average gap on SAT-type tests between children of families in the richest 10 percent and bottom 10 percent was about 90 points on an 800-point scale. Today it’s 125 points. The gap in the mathematical abilities of American kids, by income, is one of widest among the 65 countries participating in the Program for International Student Achievement. On their reading skills, children from high-income families score 110 points higher, on average, than those from poor families. This is about the same disparity that exists between average test scores in the United States as a whole and Tunisia. The achievement gap between poor kids and wealthy kids isn’t mainly about race. In fact, the racial achievement gap has been narrowing. It’s a reflection of the nation’s widening gulf between poor and wealthy families. And also about how schools in poor and rich communities are financed, and the nation’s increasing residential segregation by income. According to the Pew Research Center’s analysis of 2010 census tract and household income data, residential segregation by income has increased during the past three decades across the United States and in 27 of the nation’s 30 largest major metropolitan areas. This matters, because a large portion of the money to support public schools comes from local property taxes. The federal government provides only about 14 percent of all funding, and the states provide 44 percent, on average. The rest, roughly 42 percent, is raised locally. Most states do try to give more money to poor districts, but most states cut way back on their spending during the recession and haven’t nearly made up for the cutbacks. Meanwhile, many of the nation’s local real estate markets remain weak, especially in lower-income communities. So local tax revenues are down. As we segregate by income into different communities, schools in lower-income areas have fewer resources than ever. The result is widening disparities in funding per pupil, to the direct disadvantage of poor kids. The wealthiest highest-spending districts are now providing about twice as much funding per student as are the lowest-spending districts, according to a federal advisory commission report. In some states, such as California, the ratio is more than three to one. What are called a “public schools” in many of America’s wealthy communities aren’t really “public” at all. In effect, they’re private schools, whose tuition is hidden away in the purchase price of upscale homes there, and in the corresponding property taxes. Even where courts have requiring richer school districts to subsidize poorer ones, large inequalities remain. Rather than pay extra taxes that would go to poorer districts, many parents in upscale communities have quietly shifted their financial support to tax-deductible “parent’s foundations” designed to enhance their own schools. About 12 percent of the more than 14,000 school districts across America are funded in part by such foundations. They’re paying for everything from a new school auditorium (Bowie, Maryland) to a high-tech weather station and language-arts program (Newton, MA). “Parents’ foundations,” observed the Wall Street Journal, “are visible evidence of parents’ efforts to reconnect their money to their kids.” And not, it should have been noted, to kids in another community, who are likely to be poorer. As a result of all this, the United States is one of only three, out of 34 advanced nations surveyed by the OECD, whose schools serving higher-income children have more funding per pupil and lower student-teacher ratios than do schools serving poor students (the two others are Turkey and Israel). Other advanced nations do it differently. Their national governments provide 54 percent of funding, on average, and local taxes account for less than half the portion they do in America. And they target a disproportionate share of national funding to poorer communities. Money isn’t everything, obviously. But how can we pretend it doesn’t count? Money buys the most experienced teachers, less-crowded classrooms, high-quality teaching materials, and after-school programs. Yet we seem to be doing everything except getting more money to the schools that most need it. We’re requiring all schools meet high standards, requiring students to take more and more tests, and judging teachers by their students’ test scores. But until we recognize we’re systematically hobbling schools serving disadvantaged kids, we’re unlikely to make much headway. Almost. As Joe Romm points out at ThinkProgress, there are still some major flaws in that plan. Chief among them: the Post hasn’t made it clear what an un-devolved climate debate would look like. 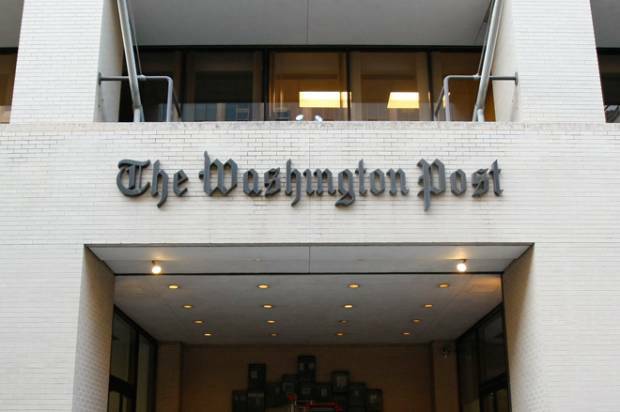 These are all long-running criticisms of the Post’s editorial policy, and this week would seem as good a time as any for the editorial board to address them head-on. Not just by publishing an editorial decrying those columnists for being so wrong, as Hiatt once did, but by making it clear that it’s refusing to run them in the first place. Because they’re wrong. Neither is a good excuse for inaction. Recent papers argue for adjusting the sensitivity range up and down, but the overall picture is stable: Scientists have reason to warn against betting human welfare on the proposition that low-end estimates will pan out. Even if the experts are too pessimistic, recent research indicates, that would not eliminate the need to slash carbon dioxide emissions over the next several decades. Scientists can also reasonably anticipate myriad negative effects in certain emissions scenarios, including sea-level rise, higher storm surges in coastal areas, more flooding elsewhere, increasingly frequent and severe heat and wildfires, extreme precipitation events, widespread changes in habitats and agricultural resources, ocean acidification with dire consequences for coral and other species, drought and the spread of disease. “If the Post is serious, it needs to start treating the story of the century as the story of the century and treating the established science as established science, not debatable politics,” Romm argues. If it’s going to publish even more editorials from people who disagree with the findings of the IPCC, the AAAS and other mainstream scientific organizations, its editorial page will be less representative than ever of the climate debate. And it’s hard to see how that’s going to serve anyone but deniers. Knarf, you are playing Straight Man now. Anybody knows me knows this one was coming. Don't mess with Alaska Girls. LOS ANGELES — The world is awash in plastic. It’s in our cars and our carpets, we wrap it around the food we eat and virtually every other product we consume; it has become a key lubricant of globalization — but it’s choking our future in ways that most of us are barely aware. I have just returned with a team of scientists from six weeks at sea conducting research in the Great Pacific Garbage Patch — one of five major garbage patches drifting in the oceans north and south of the Equator at the latitude of our great terrestrial deserts. Although it was my 10th voyage to the area, I was utterly shocked to see the enormous increase in the quantity of plastic waste since my last trip in 2009. Plastics of every description, from toothbrushes to tires to unidentifiable fragments too numerous to count floated past our marine research vessel Alguita for hundreds of miles without end. We even came upon a floating island bolstered by dozens of plastic buoys used in oyster aquaculture that had solid areas you could walk on. Plastics are now one of the most common pollutants of ocean waters worldwide. Pushed by winds, tides and currents, plastic particles form with other debris into large swirling glutinous accumulation zones, known to oceanographers as gyres, which comprise as much as 40 percent of the planet’s ocean surface — roughly 25 percent of the entire earth. No scientist, environmentalist, entrepreneur, national or international government agency has yet been able to establish a comprehensive way of recycling the plastic trash that covers our land and inevitably blows and washes down to the sea. In a 2010 study of the Los Angeles and San Gabriel Rivers, my colleagues and I estimated that some 2.3 billion pieces of plastic — from polystyrene foam to tiny fragments and pellets — had flowed from Southern California’s urban centers into its coastal waters in just three days of sampling. The deleterious consequences of humanity’s “plastic footprint” are many, some known and some yet to be discovered. We know that plastics biodegrade exceptionally slowly, breaking into tiny fragments in a centuries-long process. We know that plastic debris entangles and slowly kills millions of sea creatures; that hundreds of species mistake plastics for their natural food, ingesting toxicants that cause liver and stomach abnormalities in fish and birds, often choking them to death. We know that one of the main bait fish in the ocean, the lantern fish, eats copious quantities of plastic fragments, threatening their future as a nutritious food source to the tuna, salmon, and other pelagic fish we consume, adding to the increasing amount of synthetic chemicals unknown before 1950 that we now carry in our bodies. We suspect that more animals are killed by vagrant plastic waste than by even climate change — a hypothesis that needs to be seriously tested. During our most recent voyage, we studied the effects of pollution, taking blood and liver samples from fish as we searched for invasive species and plastic-linked pollutants that cause protein and hormone abnormalities. While we hope our studies will yield important contributions to scientific knowledge, they address but a small part of a broader issue. 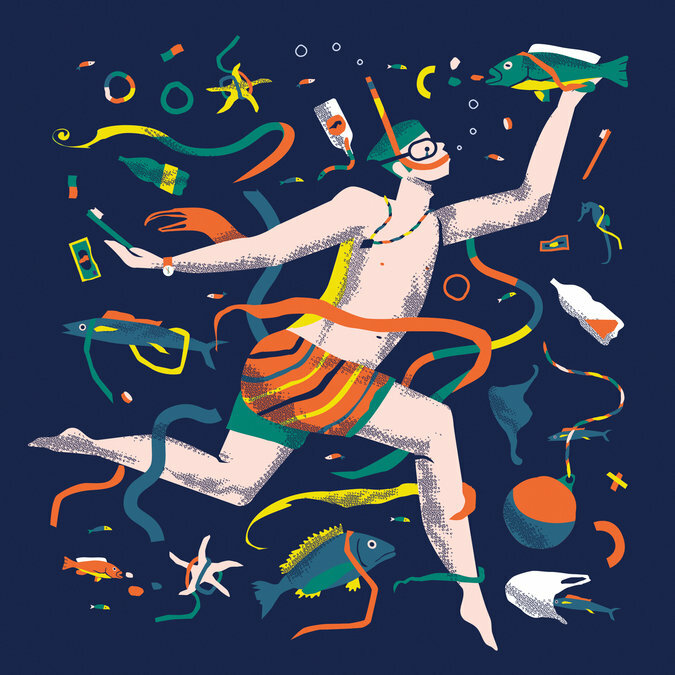 The reality is that only by preventing synthetic debris — most of which is disposable plastic — from getting into the ocean in the first place will a measurable reduction in the ocean’s plastic load be accomplished. Clean-up schemes are legion, but have never been put into practice in the garbage patches. The National Oceanic and Atmospheric Administration in the United States supports environmentalist groups that remove debris from beaches. But the sieve-like skimmers they use, no matter how technologically sophisticated, will never be able to clean up remote garbage gyres: There’s too much turbulent ocean dispersing and mixing up the mess. The problem is compounded by the aquaculture industry, which uses enormous amounts of plastic in its floats, nets, lines and tubes. The most common floats and tubes I’ve found in the deep ocean and on Hawaiian beaches come from huge sea-urchin and oyster farms like the one that created the oyster-buoy island we discovered. Those buoys were torn from their moorings by the tsunami that walloped Japan on March 11, 2011. But no regulatory remedies exist to deal with tons of plastic equipment lost accidentally and in storms. Government and industry organizations purporting to certify sustainably farmed seafood, despite their dozens of pages of standards, fail to mention gear that is lost and floats away. Governments, which are rightly concerned with depletion of marine food sources, should ensure that plastic from cages, buoys and other equipment used for aquaculture does not escape into the waters. But, in the end, the real challenge is to combat an economic model that thrives on wasteful products and packaging, and leaves the associated problem of clean-up costs. Changing the way we produce and consume plastics is a challenge greater than reining in our production of carbon dioxide. Puts the famous line from "The Graduate" in a whole new perspective, doesn't it? Scientists in Britain and the Netherlands have proposed to cut plastic pollution by the institution of a “circular economy.” The basic concept is that products must be designed with end-of-life recovery in mind. They propose a precycling premium to provide incentives to eliminate the possibility that a product will become waste. In the United States, especially in California, the focus has been on so-called structural controls, such as covering gutters and catch basins with screens. This has reduced the amount of debris flowing down rivers to the sea. Activists around the world are lobbying for bans on the most polluting plastics — the bottles, bags and containers that deliver food and drink. Many have been successful. In California, nearly 100 municipalities have passed ordinances banning throwaway plastic bags and the Senate is considering a statewide ban. Until we shut off the flow of plastic to the sea, the newest global threat to our Anthropocene age will only get worse. Nope. Those girls are very soft. Mine are much more buff than that. LOL. As apex predators, ospreys get a mega-dose of contaminants from their prey. An osprey grabs a fish in Cairngorms National Park, Scotland. PITT MEADOWS, British Columbia—On an early spring morning, the Pitt River flows so calmly that the peaks of the Coast Range seem to admire themselves in its glassy waters. A motorboat lifts a wake, and the docks of the marina moan. Standing on the riverfront dike, Sandi Lee quickly locates a soon-to-be mom. "There's a nest in the scope," says Lee, offering a look. John Elliott peers into the telescope. "What stage are we at?" he asks. In her journal Lee notes who's home: Brown cap. Fierce yellow eyes. Dark necklace on a white breast. Bigger than its companion. A female osprey. Elliott and Lee are spending a few hours on this river about 25 miles east of Vancouver counting the ospreys that have returned to lay their eggs. It's unglamorous but crucial legwork for the two scientists from Environment Canada. The large birds are living repositories for chemicals: Perched at the top of their food web, they ingest all of the contaminants in every creature below them. As one chemical is banned, another takes its place in the environment. How do we know this? The ospreys tell us. They live all over the world, up and down the coasts of every continent. "Just add water; you'll get ospreys," said Erick Greene, a University of Montana biology professor who studies them. Also called sea hawks, ospreys are almost exclusively fishers, elegantly adapted to their occupation. With talons like fish hooks, they can dive from 200 feet up, hitting the water at 40 miles an hour to grab a meal. They are the only raptor that will completely submerge in pursuit of prey. The osprey wears a black "bandit mask" around its fierce yellow eyes—most likely a smart evolutionary trick to counteract the water's glare. Yet they are remarkably mellow birds of prey—so focused on fishing that other birds can make homes in the underside of their nests, and rodents can seek shelter from hawks and eagles by living at the base of their snags. The large birds are living repositories for chemicals. They also tolerate humans well, and this has made them willing to inhabit some of the more polluted waters in North America, including the Columbia River and Chesapeake Bay. It also makes them easy to study. "On I-84 going through the Columbia Gorge, there are nests within 50 feet of the highway where there is traffic going by at 70 miles an hour," said Chuck Henny, a research zoologist emeritus with the U.S. Geological Survey in Corvallis, Oregon. The ultimate locavores, ospreys offer a precise gauge of contaminants released nearby and of chemicals that hitchhike to their habitat from thousands of miles away via winds and currents. Although they do migrate, they return to the same place, sometimes even to the same nest, to lay their eggs. As a result, their eggs and chicks offer Polaroids of pollution—snapshots of what's going on in the environment. The fact that we're seeing ospreys at all is a victory: DDT nearly wiped them out in the three decades after World War II. Since then, new threats have emerged and old threats linger. Chemicals from manufacturing, pesticides, and everyday household items like furniture, plastics, cleaners, and pharmaceuticals pollute the natural world. For many of these compounds, the long-term impact on wildlife and humans remains a question mark. In higher doses, some have impaired the ability of birds to reproduce. Some may alter their ability to migrate. Studies of other wildlife have found that these chemicals can interfere with everything from the hatching of eggs to liver development in embryos. An osprey hunkered in its nest can help tell us not only how much pollution is out there, but also how much it matters—for the osprey and for us. By the 1950s the raptor was one of our first indicators of damage from DDT, which thinned birds' eggshells, killing their embryos. Osprey populations, along with those of eagles and other birds of prey, plummeted nationwide: In New England, 90 percent vanished between 1950 and 1975, wrote David Gessner in his book Return of the Osprey. As a boy on a farm in Oregon, Henny, 71, remembers dusting his family's crops with DDT. "I didn't have a clue," Henny said of the poison he was spreading. Today he is one of the deans of osprey research in North America; he has spent a career studying contaminants in birds and mammals. Such research has shown that DDT's legacy persisted for decades: In 1998, some 25 years after the pesticide was banned in the United States, Henny found that some eggs from ospreys nesting along the lower Columbia River contained the highest DDT concentrations of any ospreys in North America at the time, thanks to high amounts found in a fish they eat, the largescale sucker. The high levels were the consequence of both predator and prey living downstream of hundreds of miles of farm fields and orchards. In most places, osprey populations had already bounced back, but the birds near the mouth of the Columbia still felt DDT's effects until around 2001, when that population finally seemed to recover, too, Henny said. Today at least 19,000 pairs are estimated to roost around the United States. Ospreys also have recovered in Europe, after more than a century of persecution and accidental poisoning. During the 19th and early 20th centuries, they were shot or harvested in many European countries—and for a time were extirpated from Scotland, where their eggs were collected, according to the Global Raptor Information Network. Now there may be 11,000 breeding pairs in Europe, BirdLife International estimates. It's mostly in the United States, though, where scientists are decoding the osprey's message about the health of the planet. Around Missoula, Montana, Greene has been using ospreys to help gauge the success of a massive Superfund cleanup on the Clark Fork River. Crews had scooped out decades' worth of toxic sludge that had accumulated from a gargantuan copper mine upstream, and Greene wanted to know how well the cleanup had worked. He turned to ospreys, so many of which nest along the Clark Fork that the local minor league baseball team is named for them. The cleanup was a success: Tests of osprey eggs downstream of the Superfund site found quite low levels of the "big five"—arsenic, copper, zinc, cadmium, and lead—targeted by the cleanup. Then the surprise: Mercury levels in the eggs were through the roof. Osprey chicks in Missoula had 300 micrograms of mercury per liter of blood. In humans, the guideline for pregnant women is 5.8 micrograms per liter, to avoid harmful effects on their unborn children. "If you or I walked into the ER in a hospital and tested out with the level that these osprey chicks have in their blood, it would be Code Red," Greene said. "Above that [guideline] in humans, people have documented what's been euphemistically called 'cognitive dysfunction,' which basically means you get stupid." In studies of many human populations, mothers' consumption of high-mercury seafood has been linked to reduced IQs in their offspring. Does this mean the osprey chicks are stupid? That's an important question, but no one knows, Greene said. Young ospreys have to learn how to hunt on their own. They also have to be able to pull off the long and complicated road trip called migration. Soon, Greene hopes to put satellite transmitters on ospreys in high- and low-mercury areas to track them and gauge any differences. In Montana, soon-to-be-published research by Greene and his colleagues has found "about 50 percent reduction in hatching success in high-mercury areas," which likely were contaminated by placer mining in the region. "There are very clear implications for human health," Greene said, as humans eat fish from the same waters. The data can help steer future state advisories about fish consumption. The research also has particular relevance now as Montana considers shipping huge amounts of its coal to China. "The number one source of new mercury into the global ecosystem is from burning coal to generate electricity," he said. It would take two months for that Montana coal to get to China and about one week for its emissions to drift back over to Montana on the jet stream, he said. It's a sad irony, Greene said, that we worry about mercury at home, only to possibly make a decision that sends more mercury our way. Logs float downriver to a pulp mill on the Fraser River in British Columbia. Such mills have released carcinogenic dioxins into the river. Back on the Pitt River, Elliott, a research scientist, and Lee, an ecotoxicology technician, walk up the dike, their eyes peeled for nests. The Pitt, before it joins the Columbia, is relatively clean and rural, its water issuing from a big mountain lake, an ideal place for ospreys to lay their eggs. They nest here every spring and raise their young before flying south for the winter. Every five years the scientists collect some of the eggs to test for contaminants. Using ospreys as monitors started here in the early 1990s with another concern. Researchers were worried that pulp mills were poisoning the Fraser, Thompson, and Columbia Rivers with dioxins and furans, which are carcinogenic byproducts created when pulp is bleached with chlorine. For all their beauty, the Fraser and Columbia—the great rivers of the Northwest—are longtime dumping grounds for industry, smelters, paper mills, and farms (orchards and row crops). Detective work that began with the discovery of a collapsed heron rookery soon spread to the monitoring of other birds, including osprey nests both upstream and downstream of the pulp mills. Research by Elliott and others found that embryos of ospreys and other birds collected near the mill sites had high concentrations of the contaminants. At the time, the contaminants didn't appear to affect either osprey hatching success or fledging of young. But a later study by another researcher found lower growth rates in nesting ospreys at a contaminated site when compared with an uncontaminated one. These findings, among others, helped change laws: In 1992 British Columbia required industry-wide changes in the bleaching process to minimize formation of dioxins. Afterward, concentrations of those chemicals and related ones plummeted in osprey eggs and in fish downstream of the mills. A newer concern is polybrominated diphenyl ether (PBDE) flame retardants, which have been used worldwide in household items such as sofa cushions and electronics. PBDEs, which can accumulate in human breast milk, may cause developmental problems in fetuses. As a result, the flame retardants have been banned in the United States and Europe. Before the 2004 U.S. phaseout, PBDEs had been on the rise in the Columbia River system. One study had found a 12-fold increase of the chemicals in mountain whitefish, a favorite osprey food, between 1992 and 2000. To learn more, Henny and his colleagues turned again to the raptors. The result was classic good news/bad news. The bad news: PBDEs were everywhere. The scientists found them in all 120 osprey eggs tested from the Columbia, Willamette, and Yakima Rivers as well as Puget Sound from 2002 to 2007. Similar results were found in Sweden, Norway, British Columbia, and elsewhere in the United States. Also, in 2006 and 2007, a handful of eggs from both the Willamette River and the lower Columbia were found with PBDE concentrations higher than one part per million, which seemed to reduce the number of fledglings they produced per nest. The good news: Concentrations of the flame retardants in osprey eggs seemed to crest between 2005 and 2007 and then decrease, likely in response to the phaseout. Relatively little is known about the effects of PBDEs on ospreys and other wildlife, but research in lab animals suggests that high levels impair thyroid hormones, which are critical for brain development. Besides PBDEs, scientists working to keep the Columbia River clean are also worried about an array of new pollutants. More than a hundred chemicals from everyday life were recently found in the street runoff and treated sewage that is discharged into the river system. USGS scientists and colleagues have found dozens of contaminants accumulating in the river's sediment, including traces of endocrine-disrupting compounds, or contaminants that mimic or block hormones. Are these pollutants having an effect? The researchers decided to examine the whole food web—topped by the osprey. Key to their investigation were "prey baskets"—picture a garbage can that hangs around a nest, into which the osprey drops scraps. Scientists examined the contents to study largescale suckers, a fish that is the ospreys' main diet in the lower Columbia. The results, published earlier this year, showed that concentrations of many of the contaminants—flame retardants, pesticides, PCBs—found in osprey eggs, as well as in sediment and fish, increased farther downstream toward Portland. In short, the more industrial and crowded the location, the more contaminated the wildlife and sediment. Moreover, several contaminants in fish analyzed by the researchers exceeded the levels in state guidelines for human consumption. The findings will be used by Washington and Oregon health officials to advise the public on how much fish is safe to eat. USGS research chemist Elena Nilsen credits the ospreys' messy garbage cans for enabling researchers to investigate these new questions. She said humans today are adding many contaminants, from cleaners to soaps to coatings, to the environment without understanding the effects on wildlife—or on ourselves. After counting ospreys at the Pitt River marina, Elliott and Lee drive a few miles upstream, to Addington Marsh, a wildlife area on Pitt Lake, the largest lake in the greater Vancouver area. It's an osprey bonanza: A stick nest as big as a wagon wheel sits on a piling every 200 yards or so, each with a female resident. Sometimes an expectant father hovers, looking useless. As they walk, Lee makes notes in her journal and Elliott switches from quiet to passionate. Over the years he has watched as pollutants in ospreys have changed: first DDT, then PCBs, then PBDEs. The only constant is that they keep coming. More recently Elliott has been studying the role of perfluorinated compounds (PFCs)—chemicals used widely to make products stain resistant and to manufacture everything from nonstick cookware to firefighting foam. While these compounds aren't stored in fat like DDT is, it can take years for them to leave the body. The results showed that concentrations of many of the contaminants found in osprey eggs, as well as in sediment and fish, increased farther downstream toward Portland. In animal studies, some of these compounds have been shown to disrupt normal hormones, suppress immune function, and cause developmental problems in rodent fetuses, according to the National Institute of Environmental Health Sciences. Other rodent experiments suggest PFCs damage the liver and reduce the viability of embryos. One of these compounds that has particularly worried Elliott and others is perfluorooctane sulfonate, or PFOS, which was used in Scotchgard until it was phased out by 3M in 2002. Five years later, in a study done along Maine's coasts and waterways, PFOS concentrations in three-quarters of osprey eggs exceeded a threshold for health effects in chickens. PFOS is a global issue: Osprey eggs from the Chesapeake Bay and the Delaware Bay contained amounts similar to those in eggs of other water birds in Japan and Norway. What does this mean for ospreys? "For some of the newly emerging contaminants, a lot of those questions are still up in the air," said Chris DeSorbo, raptor program director at the Biodiversity Research Institute. Little is known about how much of the PFCs birds can tolerate, and there is evidence that this isn't just a concern for birds: Elevated levels of perfluorinated compounds, including PFOS, are associated with kidney disease, lower testosterone levels, and other health effects in humans. Elliott's long-term studies of three seabird species in the northeastern Pacific showed that a contaminant related to PFOS has increased steadily in all the birds studied, no matter whether they lived near the shore or at sea. Just this month, findings in ospreys provided a warning about another newly emerging contaminant: prescription drugs, which are found in sewage discharge. A hypertension medication, for instance, was found in all 69 ospreys that were tested at the Chesapeake Bay. For several drugs, the scientists calculated that ospreys would exceed human therapeutic doses in just three to seven days of eating fish. Again, the effects on ospreys, or any wildlife, are unknown. Elliott finds it all a bit exasperating. "With all of these organic pollutants, every time you think it's just a matter of ushering this stuff out the door, letting it break down ... something new comes along," he says as he ends the day's work counting ospreys and walks toward the parking lot. It's hard to keep track of all the new compounds introduced into the environment, much less figure out their impacts, and it's challenging to keep the research going year after year, he says. But keeping tabs on ospreys is important for their health as well as for human health, Elliott says. Tracking them, he adds, is "almost like a time machine." We can tell not only where we've been, but also where we're headed and, with luck, he says, we can change course in time. Fights over water have pervaded the Middle East for a long time now. Water matters at least as much as land. It is at the heart of the siege of Gaza – the River Jordan is the big prize for Israel and the Palestinians. And over the years, water has brought Iraq, Syria and Turkey close to war over their shared rivers, the Euphrates and Tigris. The Euphrates flows out of Turkey, and through Syria and into Iraq, before entering the Persian Gulf via the Mesopotamian marshes. The Tigris rises The Islamic State’s quest for hydrological control began in Syria, when it captured the Tabqa Dam in 2013. further east in Turkey and flows through territory currently controlled by the Kurdish army in Iraq. There, it follows a parallel path to the Euphrates before the two rivers mingle their waters in the southern marshes. From the Tabqa Dam, the Euphrates flows downstream through Iraq. Close to Baghdad, in the center of the country, it meets the Fallujah After Islamic State forces took the Fallujah Dam, vast areas of farmland and thousands of homes were flooded. Dam, which diverts water for massive irrigation projects that produce the crops that feed the country. In early April, Islamic State forces captured the dam. Reports of what happened next are confused, but it appears that the troops immediately shut the dam and stopped flow downstream. Islamic State fighters controls nearby towns, and in recent weeks have launched repeated offensives to capture the Haditha Dam, which the Iraqi government is equally determined to hold onto. “If the dam fell, then a The Mosul Dam, the largest in Iraq, is an engineering disaster waiting to happen. large source of electricity for the capital could be shut down,” says Sticklor. The Mosul Dam is an engineering disaster waiting to happen. Back in 2007, the U.S. Army Corps of Engineers called it “the most dangerous dam in the world.” Its foundations are built on porous gypsum that is constantly being dissolved by water in the reservoir, creating sinkholes that threaten Climatologists predict the drought will be permanent and the Fertile Crescent ‘will disappear this century.’the structural integrity of the dam. Last month British researchers Furat Al-Faraj and Miklas Scholz of the University of Salford reported the demise of the Diyala River. Called the Sirwan in Iran, it is a major tributary of the Tigris, watering crops east of Baghdad. But in the past 15 years, the Iranians have reduced its flow by more than half. And worse is to come in 2018, when the Iranians plan to complete a new dam. The Karkeh River once helped fill the Mesopotamian marshes. But Iran now takes so much of its water for irrigation that the river rarely crosses the border. Angelo Di Grosso, a Californian doctor who has been an influential campaigner in the battle to legalise marijuana over the past decade, has labeled medicinal marijuana a “wonder drug” after noticing that an Adam Sandler movie “actually seemed kind of funny” while he was under its influence. Di Grosso, a self prescribed marijuana user, noticed the strange phenomenon during one of his hourly treatments against “chronic boredom” and “acute just wanna chill out after work syndrome”. The doctor, who claims to have seen most of Sandler’s movies before without finding them even remotely funny, hailed the particularly strong strain of Northern Lights he was smoking as “miraculous” after laughing “two or maybe three times” during the course of the movie. Di Grosso also explained how it was not even one of Sandler’s older movies like Happy Gilmore or The Wedding Singer, which he admitted can be “alright in small doses”, that made him laugh but instead one of his newer “pathetic movies” which are based on “typical formulaic, cross dressing, gross-out comedy that hasn’t been funny since the nineties”. Di Grosso has also indicated that he may further his research by watching a “Ben Stiller or even a Wayans Brothers’ movie” the next time he is medicating but fears that this could be a step too far suggesting that he “needs to learn to walk before learning to run”. Israel's cruel and indiscriminate shelling of Gaza caused war-seasoned US generals to express shock and dismay. There was a lot of right-wing ridicule of John Kerry's hot mic remarks on Fox News Sunday in the middle of Israel's attempt to flatten the Gaza strip, but it turns out that his anger over what Bibi did there was shared by some top US military brass, too, who had some choice words for it. Kerry’s hot-microphone comments reflect the shock among U.S. observers at the scale and lethality of the Israeli bombardment. “Holy bejeezus,” exclaimed retired Lt. Gen. Robert Gard when told the numbers of artillery pieces and rounds fired during the July 21 action. “That rate of fire over that period of time is astonishing. If the figures are even half right, Israel’s response was absolutely disproportionate.” A West Point graduate who is a veteran of two wars and is the chairman of the Center for Arms Control and Non-Proliferation in Washington, D.C., he added that even if Israeli artillery units fired guided munitions, it would have made little difference. That the Israelis explained the civilian casualty toll by saying the neighborhood’s noncombatant population had been ordered to stay in their homes and were used as human shields by Hamas reinforced the belief among some senior U.S. officers that artillery fire into Shujaiya was indiscriminate. Now we have what appears to be a long-term cease fire, at least until the next time Bibi unleashes the mad dogs of hell on people with no real defense. Was that because even Israelis disapproved of what he did in Gaza*, or because he made his point when he flattened two 12-story apartment buildings there? *It's disappointing to see that Bibi's plummeting disapproval rate was because Israelis were killed as he escalated instead of a more basic objection to leveling entire neighborhoods in the name of national security.